In advance of the Ideal Home Show 2019 at the RDS this weekend, Jen Connell picks her highlights that you definitely don't want to miss. I'll be covering the Ideal Home Show in person for RTÉ Lifestyle on Instagram. Follow @rtelifestyle and @jen_connell_ to keep up with all the action! Hosted by House and Home Editorial Director, Kirstie McDermott, this is always an informative and fun panel. I had great fun talking at this last year. This year, they will be chatting to top interior and design experts about a variety of helpful topics. Perfect, if you're planning a renovation or decoration project for your home. The Theatre covers the likes Home makeovers, interior design trends and décor, new home design and build, extending your home, colour choices, lighting, upcycling, home storage, home renovation top tips and financing your home build/purchase and much more. This is the place to pick up that all-important insider knowledge you need to transform your house into a beautiful dream home. Highlights include, 'Colour cues: tips and tricks for paint and wallpaper' with Elaine Verdon, interior designer of Leo+Cici; 'Summer's key furniture and accessory trends' with Yvonne Nugent, Harvey Norman; 'Secrets to steal from Ireland's best houses' with ‘RTÉ’s Home of the Year judges Deirdre Whelan and Peter Crowley; and 'The expert's insider to guide to renovating a period house' with Emily Cunnane, Inspace Design. The terms "sustainability" and "wellbeing" are on everyone's lips of late. This Showhouse is the perfect example of a contemporary family home that marries striking interior design with eco-friendly and wellbeing technologies. The showhouse brings the indoor and outdoor together to create a place of harmony and calmness where one can switch off and have time to themselves. Natural light is a source of wellbeing in itself and this is encapsulated through the use of magnificent glass panels surrounding an indoor atrium, drawing inspiration from traditional Japanese tea rooms. Using a tonal and earthy pallet to unite the spaces and fabric made from natural yarns, the Showhouse encompasses sustainability and wellbeing. ‘At Home with Arnotts’, is set to be a haven of interior design inspiration from Ireland’s largest department store. Arnotts will bring to life the vision of every interior design dream with a combination of the best in contemporary and classic furnishings to suit every taste at this year’s Ideal Home Show. 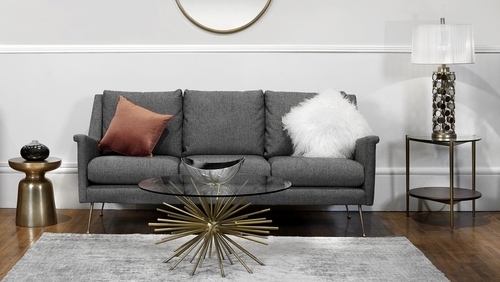 I'm most excited to see the West Elm stand - the exciting and innovative Brooklyn born interiors brand exclusively available at Arnotts will be showcasing ideas to revitalise your space whether you are looking to overhaul or enhance. To help you plan and design your garden The Garden Shop are hosting the Garden Advice Clinic where their team of award winning garden designers are available to talk to home owners on a one to one basis and help them come up with the right concept for their garden. I will definitely be availing of their free design consultation for my garden in preparation for summer! "Come along and avail of a FREE 15 min ‘1-2-1’ garden design consultation with one of our talented, award winning garden designers and leave inspired to do something exciting with your garden in 2019!" Looking for a kitchen upgrade without the huge price tag? You can completely transform the look of your existing kitchen by having it re-sprayed in the colour of your choice using the most advanced materials and equipment technology to give a quality finish that will last for years. I can't wait to discuss paint colours for my kitchen with the team. The Sustainable Energy Authority of Ireland (SEAI) has a range of grants for homeowners that can help make your home warmer, cheaper to run, and cut your greenhouse gas emissions. Over 400,000 homes in Ireland have availed of home energy grants to date. Representatives from Revenue will be at the show to advise on the various rants that are available to homeowners such as insulation grants and the First Time Buyers – Help to Buy Scheme. This advice theatre has a schedule packed with top experts on everything from mortgages to interior design to technology. Highlights include 'How to get the wow factor in your home' with Fergus Flanagan Architects, "Designing Your Home: Make every Centimetre Count" with Eva Byrne of Houseology, 10 Most Common Home Building Mistakes with Paul Moore of Mc Cann Moore Architects and The Mortgage Journey with Niamh Donnelly of Permanent TSB.